A child abduction case in Wisconsin that recently made international headlines has refocused attention on school bus stop safety. 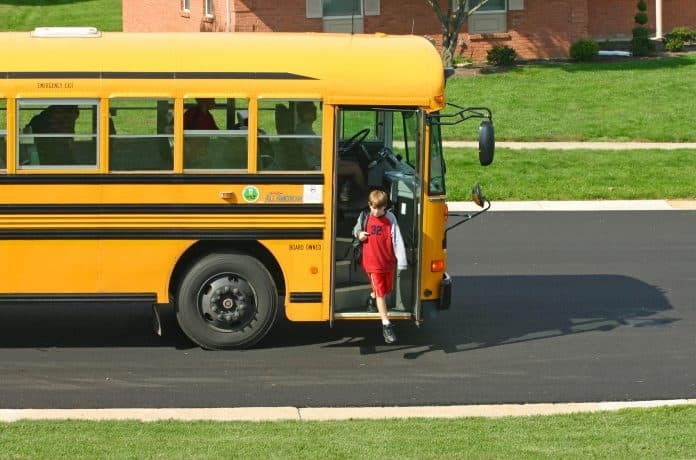 The role that bus drivers may be able to play in better keeping their students proactively safer, is a core part of the incident and aspects to evaluate. It all began in the early morning hours of Oct. 15, 2018, when law enforcement officers responded to a 911 call that originated from Barron County, Wisconsin, which is located about 95 miles northeast of Minneapolis. When officers arrived on-scene, they heard no sounds of distress coming from inside the house. However, upon entering the house, they found James and Denise Closs dead. And their 13-year-old daughter, Jayme Closs, was missing. The autopsy results for her parents later concluded they died from gunshot wounds to the head, with the manner of death ruled a homicide. It wasn’t until two weeks ago, on Jan. 10, that the world learned about what happened to Closs. She was able to escape and run for help, when her abductor left his house for the afternoon. A woman who was walking her dog encountered her and called authorities. Jake Patterson was arrested that same day while out driving, presumably looking for Closs. He admitted to murdering her parents and kidnapping the girl. He kept Close imprisoned under his bed—sometimes for hours without food or water. According to the State of Wisconsin criminal complaint released by Barron County, Patterson went to the Closs home in October. The complaint maintained that he intended to kill everyone inside, in order to take Closs. He estimated he was only in the house for a total of four minutes. Patterson was charged with two counts of first-degree intentional homicide, one count of kidnapping and one count of armed burglary. At this report, he was being held in Polk County Jail on a $5 million bail. What does this have to do with student transportation? As has been widely reported, court documents stated that Patterson said he was driving to work one morning and stopped behind a school bus on Highway 8. It was then that he said he first saw Closs as she boarded her school bus. “The defendant stated he had no idea who she was nor did he know who lived at the house or how many people lived at the house. The defendant stated, when he saw [Closs], he knew that was the girl he was going to take,” according to the criminal complaint. The document also stated that Patterson had only learned Closs’ name upon return with her to his house. Case Defies the Norm, Or Does It? An expert in the field of child sexual predators told School Transportation News that Patterson’s act was not, in fact, a random bus stop incident, but instead something that Patterson could have done before. “The actions of this predator are typical of a ‘hebephile,’ an individual who is recurrently, intensely, sexually aroused by a youth that is an adolescent,” said Dr. Duane Dobbert, a criminal justice professor at Florida Gulf Coast University and Capella University. Dr. Duane Dobbert’s expertise spans four decades. He is the author of three books pertaining to sexual predators. He has also trained school bus drivers to be the first line of defense against sexual predators. His training program, “School Bus Drivers: The 1st Line of Defense Against Sexual Predators,” is recognized by the U.S. Department of Homeland Security and First Observer. Dobbert’s classes instruct bus drivers on the typical behaviors of predators and warns them of certain actions when approaching bus stops. The training also teaches drivers to look at the perimeter of the school while children are being let out and to be alert for suspicious behavior. He offers a DVD-based program as well as live action training, and he has trained thousands of school bus drivers throughout the nation. Dobbert was a keynote speaker at STN EXPO Reno in 2009, presented an STN webinar and wrote several blogs on the role bus drivers can play in terms of sexual predators. Dobbert said it is rare for a child’s sexual predator to murder their parents, and he concluded that Patterson may also suffer from a psychopathic personality disorder. “The psychology empowers him to commit multiple murders, but the sexual paraphilia is the motivating variable,” Dobbert said. Dobbert added that he does not believe Patterson’s actions were random, but instead were directed towards his “fantasy love” interest. “He is always looking for his idea of the perfect love adolescent, and when he identifies one, he plans a stalk. Commonly, this will include the youth’s bus stop and activities,” Dobbert said. The incident refocused attention and awareness on school bus stops and the capability bus drivers have regarding behavior alertness. What Should Bus Drivers Be Looking For? School bus stop behavior and driver training are problems worldwide. The Avivim school bus massacre in 1970 was a terrorist attack on an Israeli school bus. Two rocket-propelled grenades killed 12 civilians, nine of whom were children. As a result of this attack, the Israel government began counter-attack measures, one of which was to train bus drivers, said Michael Dorn, executive director of security consultant Safe Havens International. Dorn will be returning to STN EXPO Reno this summer to speak on school bus safety and security. Additional training that is available to bus drivers includes visual weapons breaching, pattern matching and recognition, as well as terrorist specific training and human trafficking. Dorn said visual weapons breaching training teaches people how to tell if someone is carrying a firearm. Dorn continued, adding that teaching bus drivers to look for behavioral differences in communities can make a huge difference. Pattern matching and recognition trains on the ability to identify behaviors that do not fit normal, everyday activity. It might not appear to be an alarming behavior at first glance, but Dorn said it is the out-of-the-ordinary that could be a concern. Dorn also encouraged bus drivers to create respect and understanding with their students, since the behavioral training works better when the individuals are connected. “Being connected to your students, having a good rapport with them and being observant, [is valuable], so if you see something, in the case of a driver, if I greet the students every day and I am polite and respectful to them and them something comes up, I can ask the students ‘what’s going on’ and they will feel more comfortable telling me,” Dorn said. At the start of this school year, the Iowa Department of Education incorporated human trafficking training into its school bus driver annual in-service training, for both new drivers and returning drivers. Iowa was the first state to make this training, called Busing on the Lookout, a requirement for all school bus drivers. Christensen said he decided to make this a requirement after learning about what a tremendous problem human trafficking is, especially in Des Moines, where two interstate highways intersect. STN reached out to the Wisconsin Department of Public Instruction for comment on the Closs case and its effect on school bus driver training. A spokesman refused to comment. When Dorn was the police chief for Bibb County Schools in Georgia, he said that enlisting the help of bus drivers increased the ability to be aware of what was happening on the road and in the community. Dorn referenced an arrest, in which police used a tip from a school bus driver to arrest a well-known drug dealer. Dorn said the training empowers school bus drivers to be more aware of their surroundings, and illustrates how vital they are to the community and child safety. Regarding child sexual predators, Dobbert held a class in which over 400 drivers attended, along with various media outlets. He explained that these drivers also felt more empowered at the conclusion of the training. Bus drivers have an impact on student’s everyday life, they are the first people to see their students in the morning and the last people at the end of the day. The trainings mentioned above can help drivers be more aware of their surroundings and help to prevent attacks. Dorn also said that by bus drivers having a mutual respect with their students, it will be more effective in the long run. “Police officers have a myriad of responsibilities, but bus drivers have one; the safety of the children under their charge,” Dobbert said.